Welcome to Sea Mist! 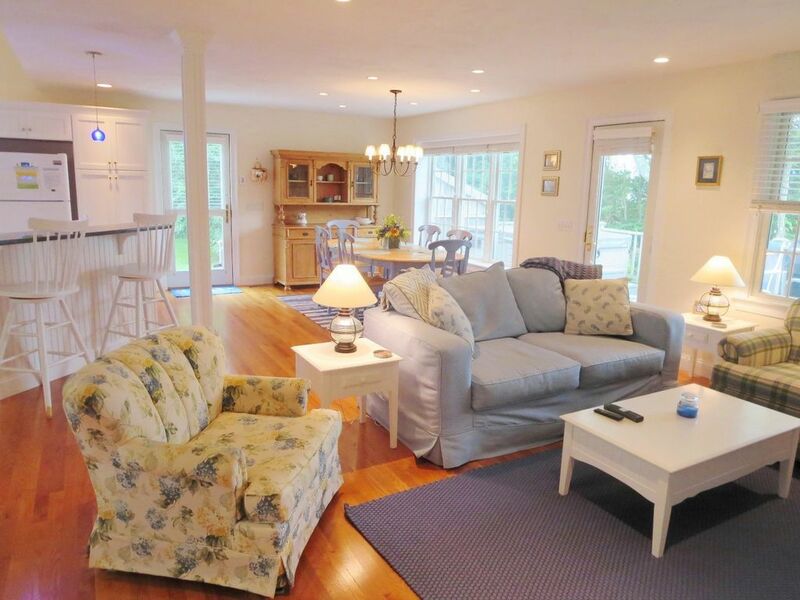 Spacious Cape Cod Beach House with Central AC and Free WiFi. Steps to the ocean with deeded access to private beach. Relax and unwind at this 3 bedroom, 2 bath home in Chatham sleeping 6. Enjoy the decks, outdoor shower, and especially the hot tub! Light, bright, and airy. This open floor plan lends to easy living on the Cape! The 1st floor offers coastal comfort with plenty of comfy seating in the living area, a cozy gas fireplace, and flat screen TV above the mantel. WiFi throughout to keep you connected. The custom kitchen is fully equipped with a dishwasher and opens to the dining area, there is also a breakfast bar with 2 stools. For your convenience you will find a first floor bedroom with a Queen bed and a full bath off of the hall with a shower. Upstairs the loft area offers a Queen sleep sofa and flat screen TV. The master bedroom has plenty of room, a Queen bed, and a flat screen TV as well. The 3rd bedroom has 2 Twins. There is a custom-tiled full bath off of the hall with a shower and soaking tub. Enjoy the balcony deck off the back with a café table and lovely views. In the basement you will find a washer and dryer for your convenience. Off the first floor living area is another deck to relax on with outdoor chaise lounge chairs, outdoor dining table, gas grill, outdoor shower, and a hot tub! It's time to rest, relax, and rejuvenate here in Chatham. No Smoking, No Pets! Max parking of cars at property: 2 (shared driveway) . No parking on lawn anytime. This home has Keyless Entry with a 3pm Check-In/10am Check-Out. 1.4 mile to the best homemade ice cream at : Short and Sweet! Welcome to New England Vacation Rentals. We are a professional vacation rental home and property management company offering vacation home rentals on Cape Cod. Enjoy our vacation beach homes in Harwich, Chatham, Brewster, Orleans, Hyannis, Eastham, Truro, Centerville, and West Yarmouth. Cape Cod Vacation Rentals are available for Fall, Spring, and Summer. We will help match the right vacation home on Cape Cod for your lifestyle and budget. We live on Cape Cod can help you with the ins and outs of finding the “just right” holiday home. Check out our Free Mobile App for Android and Apple users to find out where to eat, tour, shop and be a “local”. Memories are made in our Homes! The Seamist was very clean and comfortable. Lovely location. We loved having you stay with us over the holidays and hope to have you as a guest again soon! A warm and cosy house, literally just 2 minutes walk from the beach. Everything you need in a holiday home, house is well laid out and has all amenities you would need! There are a couple of restaurants in walking distance - one was closed for the season, but the talkative pig was a great find - just book ahead of time! A place we would love to come back to, thanks New England Vacations! Nothing was too much trouble, just brilliant! The Sea Mist is definitely an outstanding house and location. We enjoy the Nantucket Sound area and beaches so this was perfect for us. We had our family of 5 adults and were all quite comfortable (could have fit more). We entertained company with ease. Would be 5 stars except for glitches with the hot tub. Very relaxing place. Great deck with a hot tub. Clean, all the comforts of home! We had a wonderful week. We always enjoy our time in Chatham and our stay at the Sea Mist offered everything we needed. it is a lovely, comfortable home with balcony views of Nantucket Sound. We found the living space open and airy; a wonderful setting to begin and end our day. We were welcomed to the home with a gift bag of essentials which was provided by the owner. This was most appreciated and we used every item. Chatham is a perfect location; a mid-point with easy access to everything the cape has to offer. We never miss Monday night jazz at the Roadhouse in Hyannis. The restaurants continue to impress and we especially liked Pisces in Chatham and L'Alouette by Christian in Harwich. The October weather was beautiful and we enjoyed patio seating for dinner at the Chatham Inn. Of course, our first point of socializing is at Squires. The beautiful fall weather also offered the perfect backdrop for hiking on the many nature trails. A fabulous week and we would certainly stay at the Sea Mist again. Thank you for your feedback. We are happy to hear that you enjoyed your stay at The Sea Mist and all that Cape Cod has to offer! We hope to have you back again.